The two of you love to watch mixed martial arts on television and in person. In fact, you love it so much that you've been known to try out a few of the moves on each other! 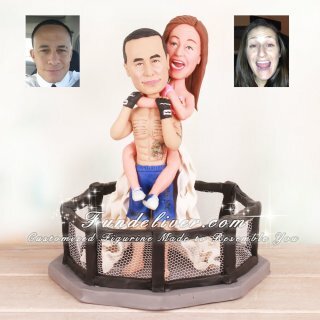 On your wedding day, you can bring a touch of comedy to the occasion by putting one of our Rear Naked Choke Mixed Martial Artist Cake Toppers atop your wedding cake! Our Rear Naked Choke Mixed Martial Artist Cake Toppers are sure to make all of your guests laugh. The design begins with the Bride Putting Groom in a Rear Naked Choke Cake Toppers figurine who has her arms wrapped around the groom's necks and her legs wrapped around his waist. The groom Chokehold Theme MMA Wedding Cake Toppers figurine is standing calmly in the middle of the octagon cage. He has both hands on the bride's arm. 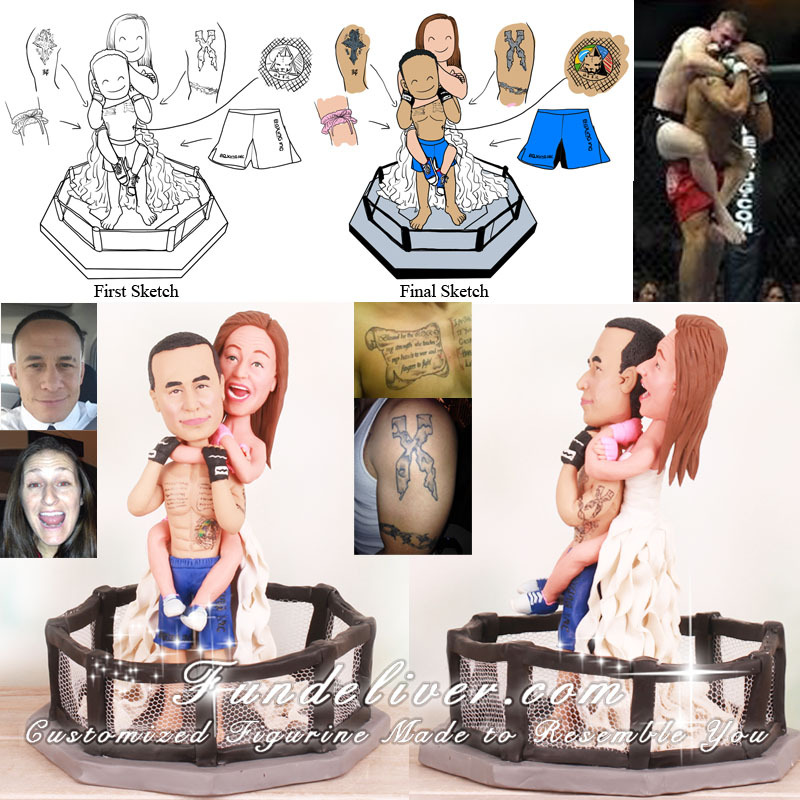 In this example design, the groom Chokehold Theme MMA Wedding Cake Toppers figurine is shown without his shirt in order to highlight his tattoos. You can see them present on his chest and arms as he poses in the middle of the cage. He wears black and white MMA gloves and blue and black fight trunks. His feet are bare as they would be during an MMA fight. The Bride Putting Groom in a Rear Naked Choke Cake Toppers figurine is wearing her complete ruffled wedding gown. On her feet, she sports navy blue Converse shoes, and she has a pink garter on her leg.